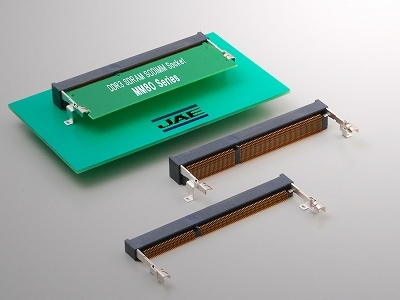 MM80 Series | Japan Aviation Electronics Industry, Ltd.
204 pin socket for DDR3 SDRAM SODIMM, compatible with JEDEC standard (MO-268C). Incorrect-insertion prevention key operating voltage is DDR3 compatible 1.5 V.
Right-angle SMT type, connector height: 5.2 mm. Reverse mounting type also available (heights: 5.2 mm). Notebook PC, Desktop PC, Server, FAX, Copier, etc.